How does Tattooing Work? Why does Tattoo Ink fade over Time? 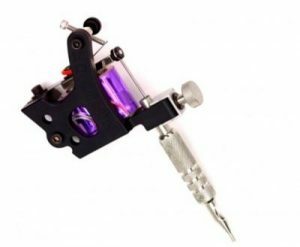 Needles of a tattoo machine punches between 50 and 3,000 times per minute through the epidermis, the outer layer of skin, and drive the ink into the dermis, the deeper layer that’s mottled with nerves and blood vessels. Every time the needle penetrates, it causes a wound that alerts the body immune system to begin the inflammatory process. That signal sends immune system cells racing to the site of the wound. Special cells called macrophages come to the rescue, eating up the dye in an attempt to “clean up” the inflammation it’s causing. The rest of the dye gets soaked up by skin cells called fibroblasts. The fibroblasts, along with many of the macrophages, stay suspended in the dermis in perpetuity. 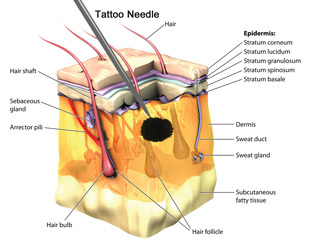 The tattooing process causes damage to the epidermis, epidermal-dermal junction, and the papillary layer (topmost layer) of the dermis. These layers appear homogenized (or in other words, like mush) right after the tattooing process. 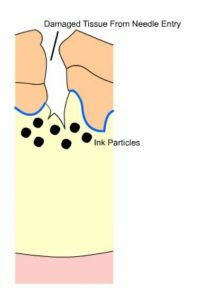 The ink itself is initially dispersed as fine granules in the upper dermis but aggregate into more concentrated areas at 7-13 days. Like any injury, the initial response is to stop bleeding, followed by tissue swelling, and the migration of non-resident immune cells into the area. The “automatic response” immune cells are mostly neutrophils, and macrophages later on. They are phagocytic cells that “swallow” debris to clean up the area and then leave via the lymphatics. This is the extent of an immune response unless an allergic reaction occurs or an infection set in. The tissue is then repaired and/or regenerated by fibroblasts. Initially, the tissue formed is known as granulation tissue (think fresh scar, pinkish and soft), which later matures into fibrous tissue (think old scar). Initially, ink is taken up by keratinocytes, and phagocytic cells (including fibroblasts, macrophages, and mast cells). 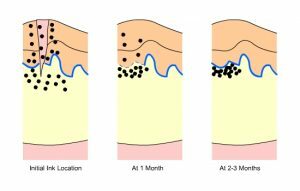 At one month the basement membrane of the epidermis (epidermal-dermal junction) is reforming and the basal cells contain ink. In the dermis, ink containing phagocytic cells are concentrated along the epidermal-dermal junction below a layer of granulation tissue that is surrounded by collagen. Ink is still being eliminated through the epidermis with ink present in keratinocytes, macrophages, and fibroblasts. Soon after the tattoo is received, one month after, and two to three months after. Note the reformation of the epithelial-dermal junction over time and the concentration of ink just underneath it. Why does Tattoo Ink fade over Time? It is debated whether all the ink particles are in fibroblasts, or if some remain as extracellular aggregations of ink. Also, the lifespan of the ink containing fibroblasts is not known. Presumably, ink particles are moved into the deeper dermis over time due to the action of mobile phagocytic cells (think immune cells), causing the tattoo to look bluish, faded and blurry. Examination of older tattoos (e.g. 40 years) shows that the ink is in the deep dermis, and also found in local lymph nodes. Since some types of phagocytic immune cells migrate to lymph nodes to “present their goods”, the discovery of ink in lymph nodes is consistent with the theory of phagocytic cells being the cause of ink movement. 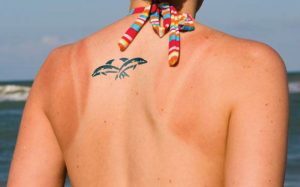 Sun exposure equals sun damage, whether you realize it or not. Langerhans cells, a type of dendritic cell, are present throughout the epidermis, but mostly located in the stratum spinosum. During sun exposure, many Langerhans cells will undergo apoptosis (a type of cell death where the cell breaks apart into many small fragments) while others migrate into the dermis and a minor inflammatory reaction occurs. The inflammatory reaction is not restricted to the epidermis but also involves the dermis. Such a reaction causes the recruitment of more phagocytic immune cells to the area. 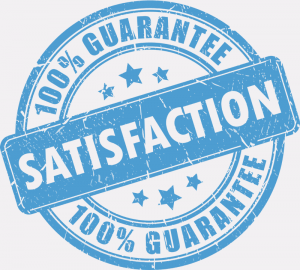 With the presence of larger than normal amounts of migrating phagocytic cells, the chances of ink movement increase, thus accelerating the fading of the tattoo. Allergic reactions: Tattoo dyes especially red, green, yellow and blue dyes can cause allergic skin reactions. This can occur even years after you got your tattoo. Skin infections: A skin infection might be possible after tattooing. Other skin issues: Sometimes bumps called granulomas form around tattoo ink. Tattooing also can lead to keloids. Bloodborne diseases: If the tattoo equipment used to create your tattoo is contaminated with infected blood, you can contract various bloodborne diseases including tetanus, hepatitis B, and hepatitis C.
MRI complications: Rarely, tattoos or permanent makeup might cause swelling or burning in the affected areas during magnetic resonance imaging (MRI) exams. Medical attention might be needed if you experience an allergic reaction to the tattoo ink or if you develop an infection or other skin problems near your tattoo. When talking about tattooing we also have to mention the body’s lymphatic system. 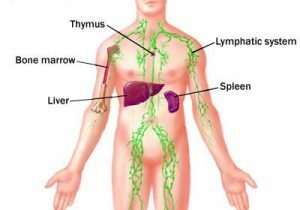 The lymphatic system is a network of tissues and organs that help rid the body of toxins, waste, and other unwanted materials. The primary function of the lymphatic system is to transport lymph, a fluid containing infection-fighting white blood cells, throughout the body. The lymphatic system primarily consists of lymphatic vessels, which are similar to the circulatory system’s veins and capillaries. The vessels are connected to lymph nodes, where the lymph is filtered. The tonsils, adenoids, spleen, and thymus are all part of the lymphatic system.